I read this book back in the 70s and loved it. Since it's been a while I thought I'd give it another read. Still good. It's a lightweight course on how statistics can be used to misrepresent information. Even if math is not your strong suit, you can follow this book and learn how to find the weak spots in a statistic. "The average Yaleman Class of '24," Time magazine noted once, commenting on something in the New York Sun, "makes $25,111." But, wait a minute. What does this impressive figure mean? Even knowing we're talking about 1924, it's hard to see this as impressive. But eventually you adjust your head for a century back. The other downside is that it doesn't take long for you to realize that you're never going to have enough information about any stat you see in a newspaper, magazine, TV show or the internet to know if it's legit. This one of two books in the list that was published before my 1996 essay. However, in a time before Amazon.com, books published by a small press in the UK were not readily available to geeks in Fred, Texas. It became apparent after only a few pages that this book is not a dispassionate examination of the subject, but rather propaganda in the purest sense of the word, "the particular doctrines or principles propagated by an organization or movement." It in no way can stand next to Bacchiocchi's book as a serious inquiry into the subject, or even next to Libatique's work, which is bush league at best. Chapter One established the foundation for a Christian version of situational ethics, destroying the credibility of any statement to follow. 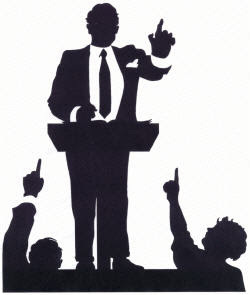 For example, when a book argues, as this one does on page 32 regarding the wedding at Cana that, "It is possible that the Lord may have made the wine in a diluted state, ready to serve," then it is apparent that we're in the full throes of an agenda fueld by speculation to support a preordained conclusion, not an honest inquiry in search of the facts of the case. I mean, I ask you, "What the heck?" And I use that term advisedly. The speculations that follow this statement beggar the imagination. It was with great effort that I forced myself to continue, even though I was already one third of the way through the book. It seems that this book, for which I paid $9.99 plus shipping comprises less than 30,000 words. It would seem that a Fred ebook, three times as long for less than a third of the price, is a great bargain! It was also interesting to see Masters advance a completely unbiblical interpretation of equating weakness in faith with reluctance to embrace legalism, in contradiction to the concepts I discovered and discuss in WWJD. However, I do have to credit him with a very clever conflation of Levitical rules and the priesthood of the believer. It would have never occurred to me to connect those particular dots. Overall, this skimpy book is short on both volume and substance. Don't bother with it, especially if you're looking for a thorough examination of the topic rather than a predictable and boring sermon. Standage's theme is that you can track the ages through the successive prominence of six beverages: beer, wine, liquor, coffee, tea, and cola. He makes a compelling case. In fact, he shows that in many cases, the drinks themselves shaped history, and in the case of tea, a corporation wielded the power of government over a large portion of the glob and instigated the tax that fomented a revolution. It's a fascinating read. I'm going to leave you with this rather lengthy quote from the end of the book about the original and possibly next global drink. As much as 40 percent of the bottled water sold in the United States is, in fact, derived from tap water, though it is usually filtered and may have extra minerals added. America's two leading bottled-water brands, Aquafini and Dasani, are derived from municipal water supplies. And although many bottled-ater labels depict glaciers, crystal streams and ice-covered mountains, tjhese images do not always reflect the true origins of the water within. A study buy the National Resources Defense council, an American environmental lobbly group, found that one brand of bottled water, labeled as "pure glacier water," came from a municipal water supply. Another brand, claiming to be "spring water," with a label showing a lake and mountains, actually came from a well in a factory parking lot, near a hazardous wasted dump. The study also noted that in both Europe and the United States, the quality of tap water is far more stringently controlled than the quality of bottled water. There is no evidence that bottled water is any safer or healthier than the tap water available in developed nations, and in blind tasting tests, most people cannot tell the difference between the two. The differences in taste between bottled waters exceed the difference in taste between bottled water and tap water. Yet people continue to buy bottled water, even though it costs between 250 and 10,000 times as much per gallon as tap water. In short, safe water has become so abundant in the developed world that people can afford to shun the tap water under their noses and drink bottled water instead. In contrast, for many people i nthe developing world, acess to water remains a matter of life or death. Proper chapter and paragraph formatting. However, problems with hypenated words were littered liberally throughout the book, manifesting as words being hyphenated even if they don't break between lines, such as "Attend-dants." Sometimes there would be a space instead of a hypen, which was even more confusing. Proofreading. I only found a few typos, for example "guesrs" instead of "guests." Overall, a decent job of ebook production, but it does illustrate my claim that ebooks are not proofread as closely as print books. I guarantee you no print book would leave a publisher with dozens of words with hypens or spaces in the middle of them. "It is interesting to note that God knew perfectly well when inspiring the authors of the Bible that using an ambiguous word here (and in many other places) would cause centuries of debate. If He had wanted to make it clear one way or the other, He could have easily done so." Am I to conclude from this passage that God knew his ambiguity would cause confusion and intentionally created ambiguity for that purpose? This sounds suspiciously like the "God placed dinosaur fossils in the earth to give the appearance of age" argument of creation over evolution. This and other similar issues left me feeling the book was less than helpful. I bought this a few months ago but have been saving it as a treat to myself. I picked it up during the week between Christmas and New Year and forced myself to only read a little at a time so it would last the whole week. I finished it on Dec 30, so I was almost successful. The second Flavia de Luce novel is just as well written as the first one, but it takes a little longer to get to the crime, which doesn't happen until page 151. But Flavia is entertaining even when there is no dead body, so that doesn't put any marks against it in my book. Time to get A Red Herring Without Mustard. Only one released after that one, so I need to take them slowly to reduce the gaps between books. Bacchiocchi proclaims at the outset to adopt a prohibitionist stance. I found a lot of the examination of the original language to be enlightening and worthy of reflection, but the ad hominem attribution of ulterior motives to scholars who translated things differently weakened his credibility, especially when he evinced the same propensities himself. In addition, in the problem passages and elsewhere there seemed to be a significant amount of begging the question. All that notwithstanding, for a serious student of the issue it's worth a read for the analysis of the original language alone. Just keep your logical fallacy filters on high. Being a big fan of Buckley's Blackford Oaks spy novels, I decided to give this book a whirl. Angleton was the head of CIA counterintelligence from 1954 to 1975 and Spytime is a novel based on Angleton's career. It's been almost two decades since I read a Blackford Oaks novel so I could be wrong, but I recall them as being more engaging than Spytime. It's a decent enough read, but not something I found myself dying to get back to. Halfway through the book a b-story starts, featuring one of Angleton's operatives and almost nothing of Angleton, and goes on for 120 pages (over a third of the book) before it is rather abruptly cut off 40 pages from the end of the book. I found that a little annoying. But if you're a fan of spy novels, or of history, this might be the book for you. Yo, ho, ho, it's a writer's life for me! Once, asked about his writing routine, Doctorow said: "Here's how it goes: I'm up at the stroke of 10 or 10:30. I have breakfast and read the papers, and then it's lunchtime. Then maybe a little nap after lunch and out to the gym, and before I know it, it's time to have a drink." The current paster in Fred, Texas reviews Welcome to Fred. 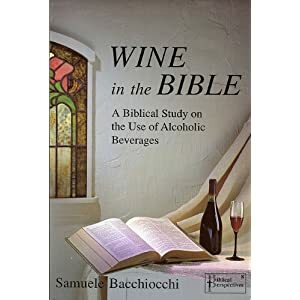 In 1996 I did a study of all the verses in the Bible that referred to wine and strong drink and it found its way to the Internet under a pseudonym. That essay was quoted in The Year of Living Biblically, was evidently the primary source material of a Relevant Magazine article, was credited by Michael Spencer (RIP) aka The Internet Monk in a 2005 posting, and referenced by dozens of other sites on the internet. I recently decided to update the essay and released it as What Would Jesus Drink? I released it in digital form as a 99-cent ebook (the lowest price allowed) on Amazon and other outlets. I also made it available in paperback for those don't do ebooks, also priced as low as the system would allow, which comes out to $7.49. Amazing what going from electrons to paper can do to the price! You can see the table of contents and read a chapter or so on Amazon. I have to say a big thanks to Hilary Combs for the beautiful front cover and Tosh McIntosh for the designing the rest of the cover and the interior of the book, a huge undertaking. As I worked on this project, I read some of the books that surfaced in the intervening fifteen years. Most of these were not available when I did the original study, otherwise I probably would not have written my own. In the next several weeks I'll review the books I read. I'll give you a little hint about what is to come. 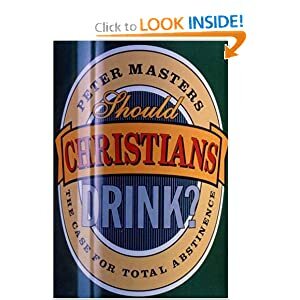 Most of them are against any kind of drinking, and the best book in that category was published in 1871. 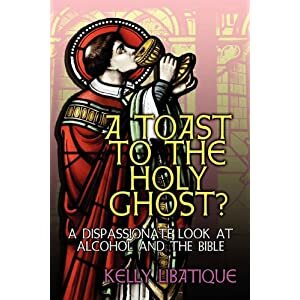 The anti-drinking book guys who have published in the last two decades could have learned a few things from Rev. William Patton. 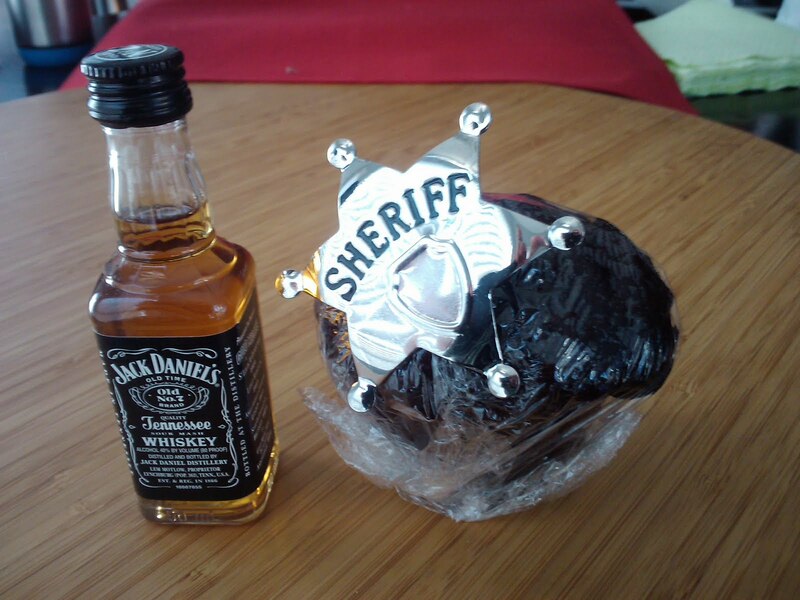 Norm, technical consultant on the poker scenes in Muffin Man, brought me this gift on New Year's Eve. In case you can't tell, that shiny dark thing is a muffin in plastic wrap. Status report on Muffin Man: Second draft will begin in two weeks. I'm shooting for an April Fool's Day release. We shall see if I make it. BradNotes subscribers get an exclusive sneak peek at Muffin Man: Day 1, the first 75 pages of the first draft, and an email notice when the book comes out. Sign up by sending an email to BradNotes@BradWhittington.com. You can catch the first page here. 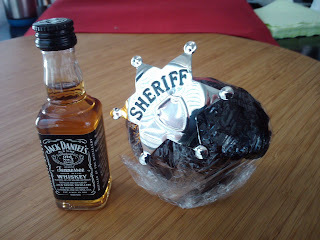 UPDATE 1-5-2012: I ate the muffin. It was more like a mini chocolate cake, very moist and quite good with medium roast Columbian coffee made strong. Num!